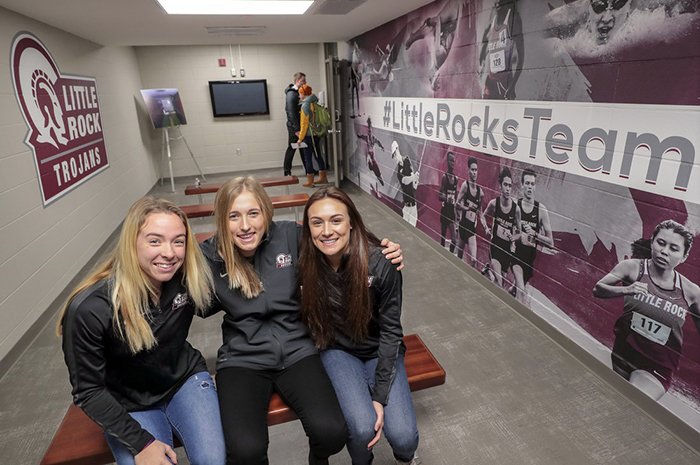 Little Rock Athletics officially unveiled the updates to the newly named Donaghey Athletic Center (DAC) on the University of Arkansas at Little Rock campus on Feb. 8. The renovations are a significant upgrade to one of the original athletic facilities, which was constructed as the Trojan Fieldhouse in 1969. 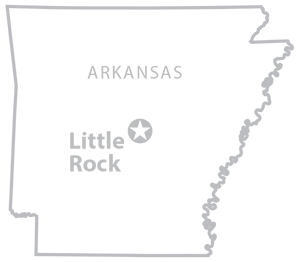 The $725,000 project was funded in part through a generous private donation from the George W. Donaghey Foundation. The project will provide much needed enhancements and updates to areas used by Little Rock student-athletes. The nearly 15,000-square-foot Donaghey Athletic Center houses coaches’ offices and meeting space, locker room and training facilities, and academic support services for the Trojan swimming and diving, soccer, men’s and women’s golf, and men’s and women’s track and field/cross country programs. It also houses the Aquatic Center, the home pool for the Trojan swimming and diving team. The renovated center provides student-athletes with an updated weight room and team meeting space, as well as the addition of a nutrition center. The coaching and administrative offices were also remodeled, along with the locker rooms and common areas. Renovations began in August, and most of the work was completed in January. Photo top right: UA Little Rock student-athletes visit the newly remodeled Donaghey Athletic Center. 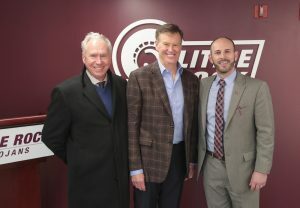 Above: UA Little Rock Chancellor Andrew Rogerson, Greg Flesher, and Chasse Conque attend the grand opening ceremony for the Donaghey Athletic Center on Friday, Feb. 8, 2019.